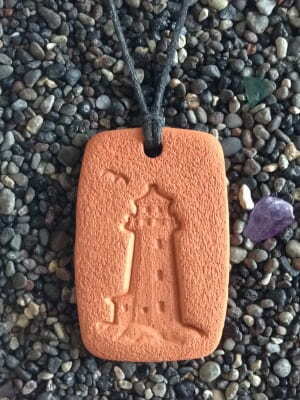 The Lighthouse is a symbol of the sanctuary of home and the guiding light that delivers you there safely. It also symbolizes vigilance and altruism as the lighthouses of old were manned by brave and caring souls. The lighthouse shows us the way to go, supporting our efforts to persevere even during turbulent, challenging times. The Lighthouse Pendant measures 2.7 cm by 4.2 cm (1 1/8i n by 1 7/8 in).